SOUQ.com today announced it has entered into a definitive agreement to purchase Wing.ae, a marketplace for merchants and couriers in the UAE, providing innovative mobile and web-based user-friendly delivery solutions for businesses and individual consumers. SOUQ.com previously invested in Wing.ae and will be acquiring 100% of the company. Wing.ae now has the full backing of SOUQ.com, a subsidiary of Amazon.com, and this investment demonstrates the continued commitment of all three companies to provide SOUQ.com customers with a world class experience. Wing.ae will continue to invest in growing its same and next day delivery service in the region, enabling greater convenience for Wing.ae’s customers, including SOUQ.com. 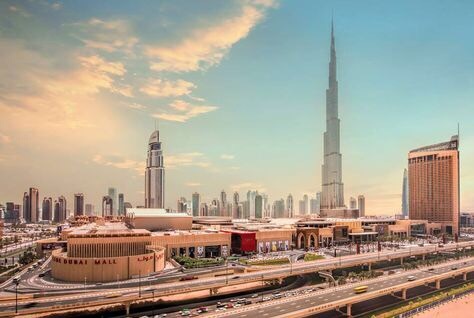 Emaar Properties has unveiled plans to build a new mall in the Dubai Hills Estate, one of the largest master-planned communities being developed in Dubai, UAE, in joint venture with Meraas. 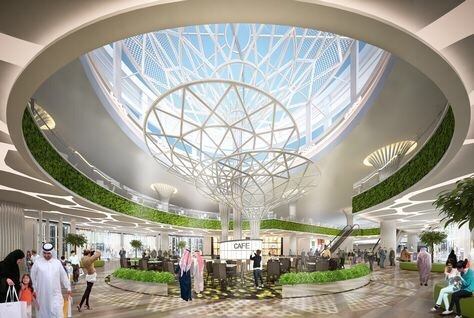 Scheduled to open in late 2019, Dubai Hills Mall will feature 2 million sq ft of leasable space spread out over ground and first floor levels, more than 750 retail and food and beverage outlets, family entertainment. The mall will also feature a cineplex, a 65,000-sq-ft hypermarket, seven anchor retail experience stores, and dedicated parking spaces for over 7,000 vehicles. Located on the corner for Al Khail Road and Umm Suqeim street, the mall can be seamlessly accessed from Downtown Dubai, Emirates Hills, Dubai Marina, Arabian Ranches and other nearby communities. The architecture and interiors take inspiration from the concept of a central courtyard with a series of interconnected streetscapes. The angular layout provides easy orientation and a clear focus on the central space for events and special features. The exterior boulevards and concert spaces offer more leisure options, making the mall a perfect escape for all types of visitors, Emaar said. The mall complements the destination’s high-end residential, commercial and office spaces, chic hospitality offerings, enriching leisure facilities and its prestigious golf fairways. In collaboration with Meraas, Emaar Properties has unveiled Dubai Hills Mall project, a family retail district within master development Dubai Hills Estate, slated to elevate the emirate’s retail offering upon completion in 2019. The highly-anticipated destination will boast over 18.75ha of gross leasable area accommodating some 750 fashion and dining outlets. 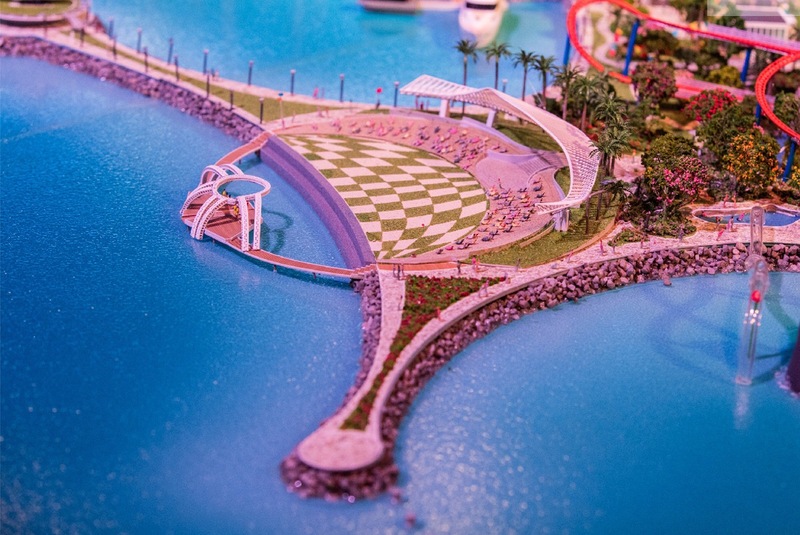 Complementing the lifestyle landmarks of the location, the venue will also attract visitors with four major family entertainment and leisure centres, including a cineplex, outdoor concert area, hypermarket and seven anchor retail experience stores, among others. British luxury retailer Fortnum & Mason has closed down its store in Dubai, it confirmed on Thursday. 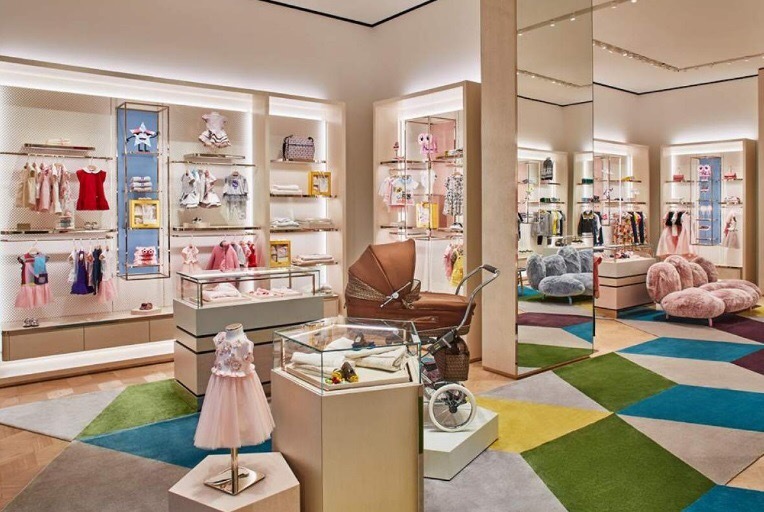 Located in Downtown Dubai, the multi-level store was opened in 2014 as Fortnum & Mason’s first location outside London. However, the brand said in a brief statement that the slowdown in the economy had led to the outlet’s closure last month. “Due to the well-documented ongoing challenges with market conditions in Dubai, we have made the considered decision with our partner Al Khayyat Investments (AKI) that we will cease trading on the 9th of July,” it said. “Fortnum’s will continue to be an English brand with a global palate. Our products are available to our customers in Dubai and around the world as part of our offer on fortnumandmason.com,” it added. The British brand started in London in the early 1700s, and is most famous for its tea, confectionery and hampers. 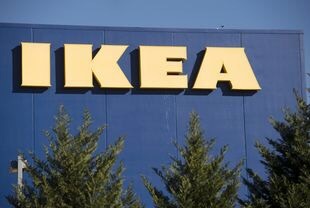 In a statement, AKI also confirmed the news but added that it will continue to be a “key market leader for our other international brands”. 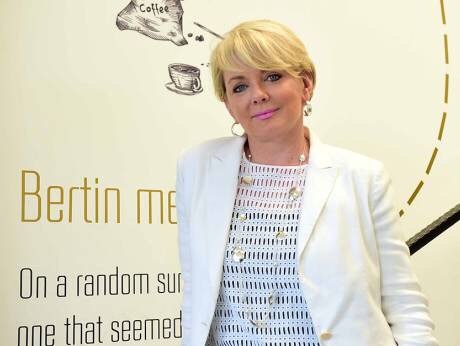 According to its website, the other food and beverage brands in the company’s retail portfolio include Il Caffe di Roma, Espressions – that also features Lavazza products and Burger Fuel. Despite the softening in regional economic conditions, consumer spending in the UAE is growing strongly, according to recent research released by the Dubai Chamber of Commerce and Industry. Spending is expected to exceed $261bn in 2021, compared to nearly $183bn in 2016, the report found. The research, based on recent data from Euromonitor International, revealed that consumer expenditure per household during 2016 in the UAE (around $103,000) was the highest when compared to other GCC countries. Looking at consumer spending in the UAE in 2016, while housing was identified as the top category with $75.7bn, food and non-alcoholic beverages came second with $24.8bn worth of spending during the year. 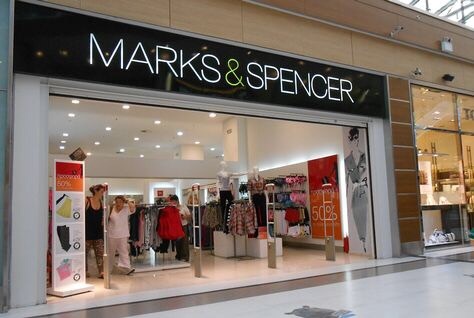 Following a major revamp, Marks & Spencer’s flagship store in Dubai Festival City Mall has re-opened. For the first time in the UAE, you can now take a swift break from shopping at M&S and experience what the retailer is calling a premium, table-waited dining experience at the M&S Café. The new dining experience is offering up a range of mid-retail therapy goodies, including pastries, smoothies, soups, salads, sandwiches, pastas and even British favourites including fish and chips (see Pierchic’s claims to the world’s poshest fish and chips here) and afternoon tea. But the relaunch hasn’t just focused on the café alone. M&S has also launched its Food Hall, showcasing more than 1,200 premium grocery brands and lines. From fresh fruit and veggies to oven meals and daily staples, M&S is bringing its signature British quality to Dubai Festival City. There’s also a brand-new M&S Home department, with the widest range of the brand’s homewares in the UAE. Expect new bedding and towel ranges, crockery and crystal glassware, for example. All of which will go alongside the store’s existing range of fashion for men, women and kids. We’re hoping the M&S Food Hall will be stocking its bottles of Belgian chocolate milkshake – they are unbelievable. Open Sun-Wed 10am-1pm; Thu-Sat 10am-midnight. Dubai Festival City Mall, www.marksandspencerme.com (04 206 6466). Chinese technology company, Xiaomi, is focusing on offline stores to boost sales after suffering setbacks at the hands of local competitors over the past two years. The firm was the top seller in China in 2014 and 2015 but lost ground to Huawei, Oppo, Vivo and Apple last year. This year, the company has moved back into the top five ranking worldwide with a year-on-year growth of 58.9 per cent in the second quarter, according to research firm International Data Corporation’s (IDC) estimates. The company also unveiled two new smartphones — Mi 6 and Mi Max 2 on Thursday. The 1,500 square feet Mi store at BurJuman Centre in Dubai is with an initial investment of more than Dh2 million. “We open stores where there is high traffic. If we were selling only mobile phones, then customers would come every two years. Once you have more than 300 products displayed, we find that more customers come often to find out what new products we have,” Sung said. Ravi Matthew, deputy CEO and General Manager of Task, said that step by step, Xiaomi aims to bring all its ecosystem to this region. While the company is best known for phones, it has invested in 77 start-ups and now offers air purifiers, drones, TVs, speakers, TV set-top boxes, electric cycles, robots and robot vacuum cleaners. “We are looking for space in other malls in the UAE. We will be opening three more outlets in Dubai by end of this year. We are also planning to have stores in other emirates also,” he said. He added that offline sales will be quite significant for the company. In India and China, only 30 per cent of the mobile phone sales come from online while the other 70 per cent come from offline. The percentage of online smartphone sales is much lower than that in the Gulf. So, the offline market is “very important for us”. The Chinese company is planning to open three new offline stores in Egypt in the next two months. Sung said that it has 140 offline Mi retail stores in China and hopes to have 1,000 shops in China and 1,000 abroad over the next three years. “Our focus is still on smartphones but IoT [internet of Things] is important because we want to offer a full range of services to our fans. The smartphone will be the centre and everything can be managed through the phone,” Sung said. OFFERING high quality fashionable products at great prices, Max Fashion has launched its first store in Malaysia at IOI City Mall, Putrajaya. Max Fashion is part of the Landmark Group, which is one of the largest retail conglomerates in the Middle East and India with its headquarters in Dubai, UAE. The store was launched by Landmark Group group director and board manager Ramanathan Hariharan. Also present was artiste Scha Al-Yahya. “Max Fashion started in Dubai in 2004 and this year marks our 13th year in the fashion and footwear industry. “We offer our customers trendy and fashionable items but at very reasonable prices,” said Ramanathan, adding that Max currently has a total of 400 stores with 10 million loyal customers. Offering well-designed products at a bargain, Ramanathan believes there is an immense potential for growth and is looking forward to expanding to other parts of the country, especially in the Klang Valley. “I believe this is the right time for our brand to enter the Malaysian market and I am very excited to engage with the customers,” he said. Max Fashion hopes to provide the best shopping experience for their customers. “We also want our customers to have a memorable shopping experience, so we broadened the scope of products to not only include clothes for men and women, but also trendy footwear and accessories,” he said. In the next six months, Max Fashion will open several more stores in the country, specifically in the Klang Valley, and is working on an online store within the next year. UAE-based Gulf Capital said more than 76 per cent of the work has been completed on its $1-billion retail venture coming up in Abu Dhabi and is on track for opening by the end of 2018. Al Maryah Central, located at Al Maryah Island, is a joint venture project between Gulf Capital and the US-based Related Company. The project is progressing well, on tack and on budget. 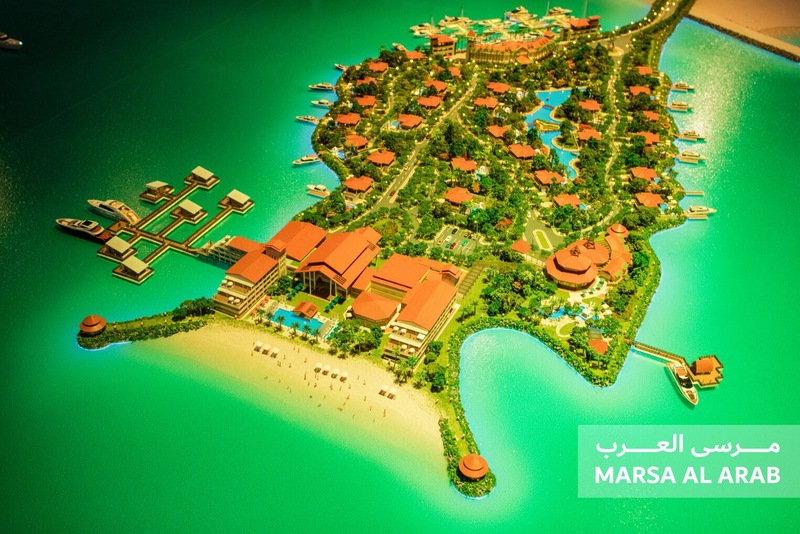 It will open by the end of next year, reported Gulf News, citing Gulf Capital’s top official. 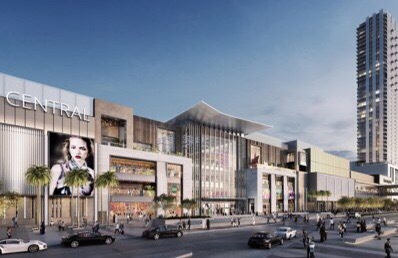 The 2.8 million sq ft mall will feature the first Macy’s outside of the US, the first Bloomingdale’s in Abu Dhabi and 20 specialist Al Tayer stores as part of the 400 store retail offering. In addition, Al Maryah Central will include 100 restaurants and cafés, a 21-screen Vox Cinema with Imax and a host of other attractions. Subsequent phases of the development will include residential units and a hotel in two high-rise towers. According to him, the mall will have a mix of entertainment and dining that will drive a lot of traffic. “About 20 per cent of the mall will have food and beverage component and 10 per cent entertainment. That is important because you just can’t have retail alone,” he noted. “Apart from this, we are bringing a number of new brands to the region. 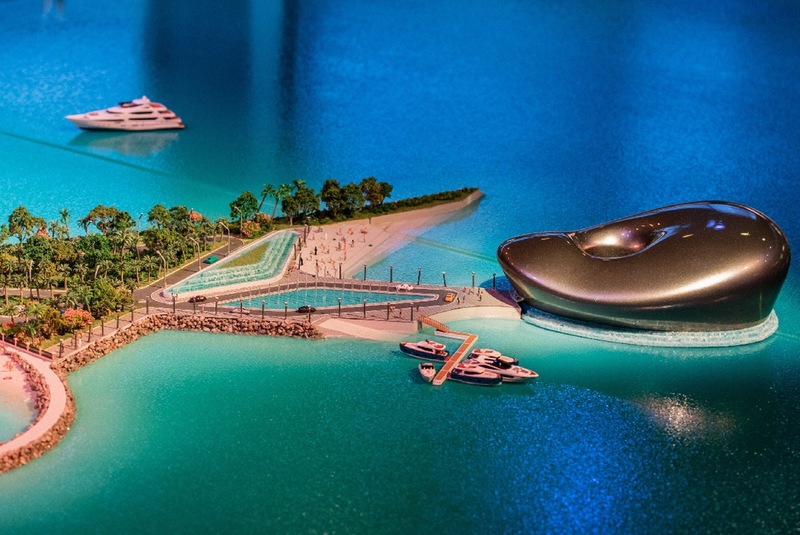 This will be a unique mall on par with what you see in the US or Europe,” explained Al Sohl. On the leasing activity, Al Solh said 50 per cent of the retail space is already leased with a number of new potential customers showing interest. “We are expecting 70 per cent of the mall to be leased by the end of this year,” he told Gulf News. The new shopping mall will be linked to the adjacent property, The Galleria Mall, which opened in 2013 and was also developed by Gulf Related, said Al Sohl. On its regional projects, the company chief said its residential project in Saudi Arabia will be built in phases due to slowdown in the economy. The firm is building 520 units including villas, town houses, and apartments. Dubai retailers are gearing up for a three-day ‘Super Sale’ in the emirate starting Thursday May 18. 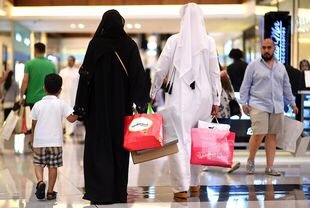 More than 750 retailers across the emirate – more than 250 brands – will slash prices, knocking between 30 percent and 90 percent off products. Some of the brands offering discounts include Guess, Steve Madden, Kurt Geiger, Roberto Cavalli, Galeries Lafayette, Furla, Missoni, Boutique 1, Scotch and Soda, Balmain, Aldo, Toms, Birkenstock, Charles & Keith, Nine West, Desigual, Al Jaber Optical, IDdesign, Marlin Furniture, Porsche Design and Disney Fashion. More than 1,000 retail outlets across Dubai will offer discounts on a range of electronics, jewellery, toys, homewear, furniture, apparel and fashion. The pre-Ramandan sale is organised by the Dubai Festivals and Retail Establishment (DFRE), an agency of the Department of Tourism and Commerce Marketing (Dubai Tourism). Boasting unobstructed views of the world’s tallest skyscraper, the Burj Khalifa, via a 180-foot wide, artistically designed carbon fiber array of motorized windows, Apple’s latest upscale retail store will be opening tomorrow, April 27th, 2017, at the swanky Dubai Mall in the United Arab Emirates. 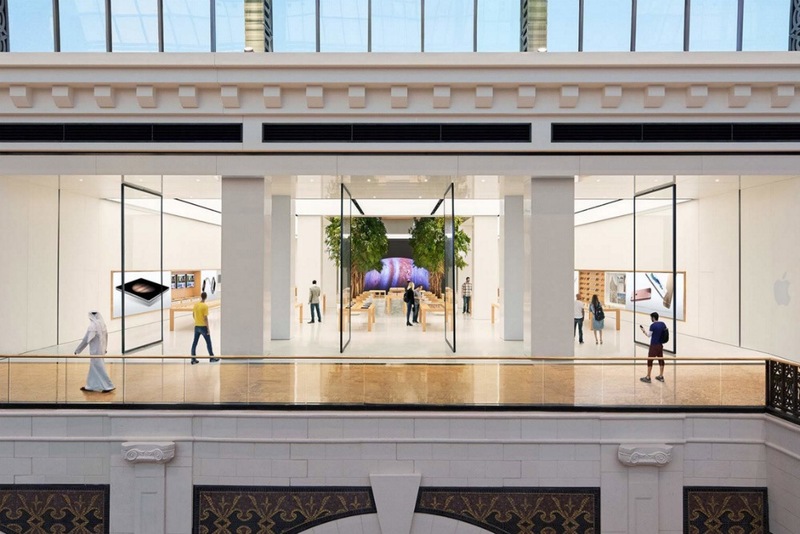 Designed in collaborating with Foster + Partners — the same design team behind Cupertino’s brand-new Apple Park headquarters — the Dubai Mall Apple Store features an ever-changing array of 37.5-foot tall windows, overlain with super-strong carbon fiber panels that are capable of meticulously shifting orientation based on the fluctuations of external temperature in Dubai. These magnificent carbon fiber windows will also provide visitors an unobstructed view of one of Dubai’s greatest attractions: the Sama Dubai — a spectacular water fountain show that takes place every evening, and is conveniently located right below the Apple Store terrace at Dubai Mall. 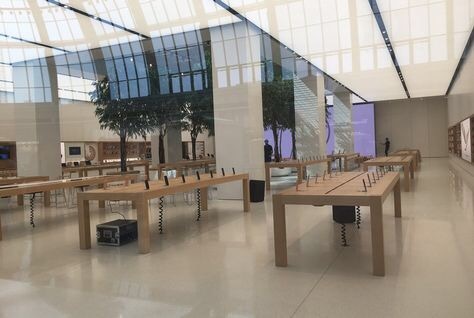 Appropriately, Apple in its press release has invited visitors of the new location to enjoy the beautiful fountain array, which can be seen taking place in the first of two YouTube videos below. 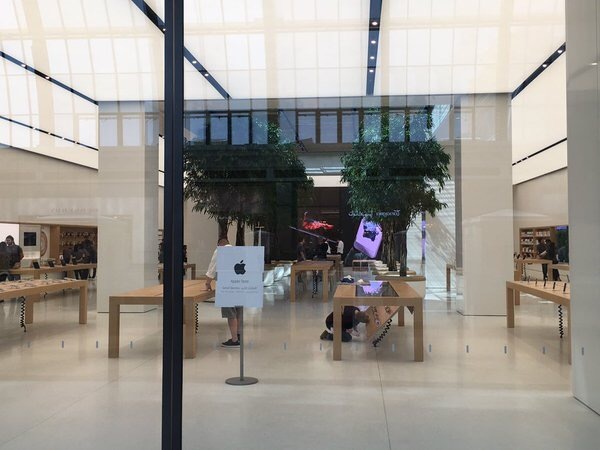 Also be sure to check out the second YouTube video, which gives us a glimpse of the Dubai Mall Apple Store, itself, and the surrounding area. 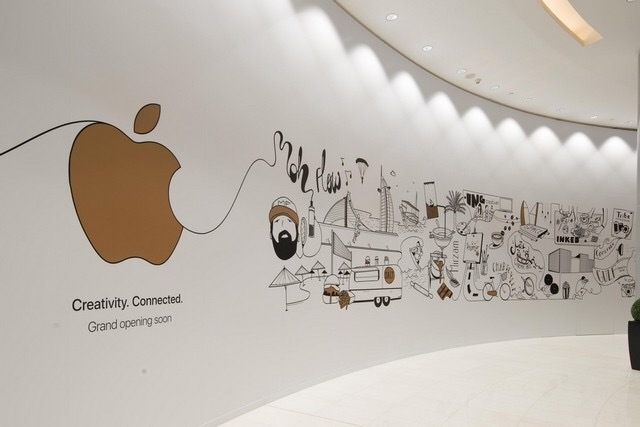 The company was sure to emphasize in its press release that the grand-opening of the Dubai Mall Apple Store is a way to draw more attention to its recently announced workshop series — dubbed Today at Apple — which will essentially embody a series of free education courses, focusing on a variety of topics including art, design, photography, and software coding, among other concepts. 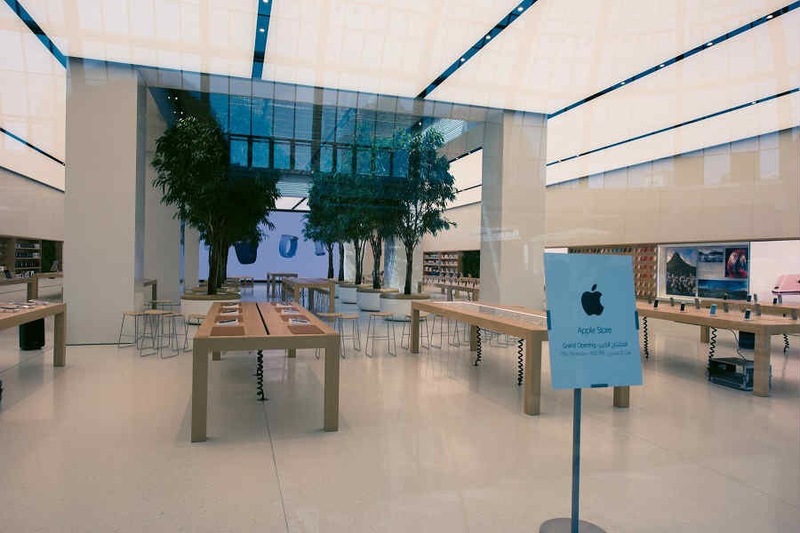 The Dubai Mall Apple Store will also host a variety of high-profile events, many boasting live music, conversations with film-makers and photographers, and additional live workshops hosted by some of the world’s leading talent on the subject at hand. 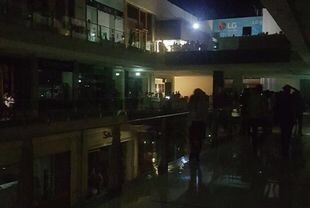 Dubai Mall, one of the world’s biggest shopping centres, was plunged into darkness on Monday evening after experiencing a power cut for nearly two hours. According to photos posted on social media, hundreds of shoppers were forced to wander the mall in the dark. Lights went out and escalators stopped working at about 7.15pm local time. At just before 9.15pm, Dubai Media, which initially announced the power outage, said the power had been restored. The Dubai Mall issued a statement saying it regretted the inconvenience caused to shoppers and thanking them for their patience. Dubai Electricity and Water Authority said the outage was caused by a problem with a cable at Dubai Mall Metro Station. One Twitter user said earlier that shoppers were using the flashlight on their phones to navigate around the mall. The American fashion brand Nautica relaunched its Dubai Mall store on Tuesday with new partner Apparel Group. In an interview with Gulf News, Patricia Canavan, Vice President and General Manager — Nautica Licensing, said that there would be two further store openings this year in the GCC. She added that the brand was targeting the Avenues mall in Kuwait and was looking to launch in Jeddah also. Nautica, established in New York City in 1983, currently has 12 stores in the Gulf region, and is aiming to add 18 stores in the next five years, according to Canavan. “From a population perspective Saudi Arabia represents the greatest opportunity for expansion. We are looking at opening in the tier two cities, as well,” she said. The company also believes that Saudi Arabia also holds the biggest potential for the growth of their online business. Apparel Group, a Dubai-based retail conglomerate, is the local partner for brands such as Calvin Klein, Cath Kidston and Tommy Hilfiger. It operates over 1,700 stores across the region. Together, the senior Nautica official said, they have overhauled the flagship store in Dubai Mall. “We are reintroducing the brand in various ways. It is a new retail concept for us in Dubai,” Canavan said. Canavan said that Nautica was developing its relationship with the Apparel Group, who has the expertise and can give us feedback on the new product as we go and ensures that we do not alienate existing customers. Dubai will remain the lifestyle brand’s hub, she said, despite Saudi Arabia potentially making up 50 per cent of the company’s business in the future. 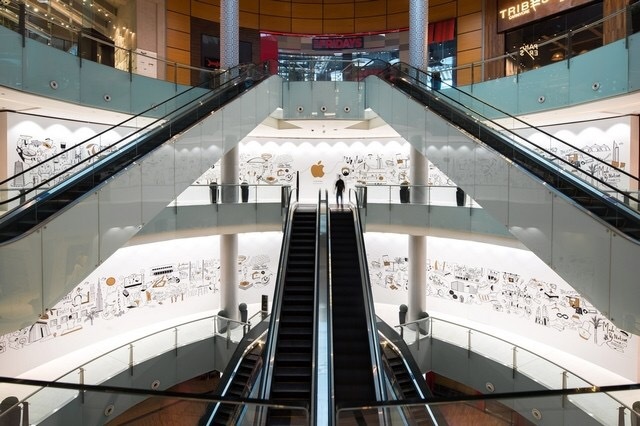 This market “has done a better job than most at diversifying away from pure retail experiences,” Canavan said in the interview, noting that the future of malls was about engaging with customers, not simply trying to sell to them. “Having ski slopes, having fountains, having parks — that’s the future of retail,” she said. The founders of Landmark Group, a Dubai-based multinational conglomerate, have been inducted into the Retail Hall of Fame during the recent 2017 World Retail Congress at Madinat Jumeirah Hotel in Dubai. Chairman Micky Jagtiani and vice chairperson Renuka Jagtiani were given the award during a private ceremony the the global event. 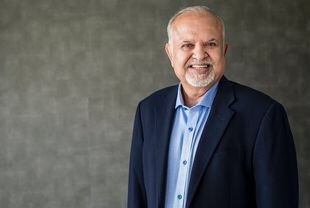 Micky Jagtiani founded the Landmark Group in 1973 with a single store in Bahrain and has successfully grown it into one of the largest retail and hospitality conglomerates in the region. A constant innovator, he has created and conceptualised over 27 diverse brands, several of which are market leaders today. The group has over 2,400 outlets across 30 million square feet, catering to a loyal customer base of over 30 million people across the Middle East, North Africa and the Indian subcontinent. group’s corporate strategy, built its fashion and hospitality business from the ground up, led its expansion into new countries and launched its e-commerce platform. Over the past four decades, the Landmark Group has established itself as a diversified international retail and hospitality conglomerate. “Retail for me has always been more than a business, it is a way to life and it is about people who have helped me get here,” said Micky Jagtiani. 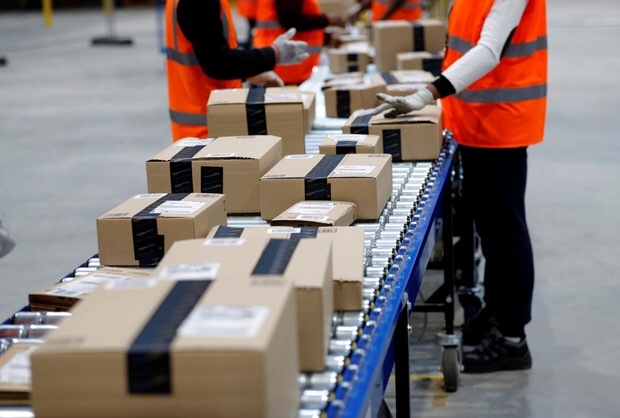 Kuwait-based Kamco Investment Company on Sunday said it has purchased Amazon UK’s largest distribution warehouse for $77 million (AED281m). The warehouse in Dunfermline, Scotland, has been leased to Amazon UK Services until October 2031. 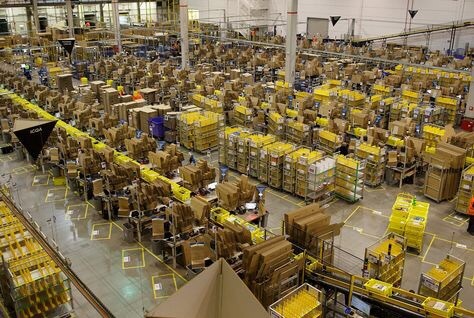 Amazon employs 2,100 staff at the warehouse, which handles 38 percent of the 143 million packages that e-retailer handles per annum. Kamco said it aims to achieve a targeted cash yield of 6.50 percent per annum and an expected internal rate of return (IRR) of 7 percent per annum during the investment period. Company chief investment officer Khaled Fouad said the transaction highlights the acquisition of a new category of income-generating assets that are leased to Amazon, in aim of diversifying sources of income. Kamco’s alternative investment team currently manages more than $250 million in real estate across 11 regional and international properties. The World Retail Congress (WRC) begins on Tuesday in Dubai amid weak consumer demand, caused by a strong dollar and job concerns. Brick-and-mortar retail has also suffered as ecommerce begins to grow in popularity across the region. 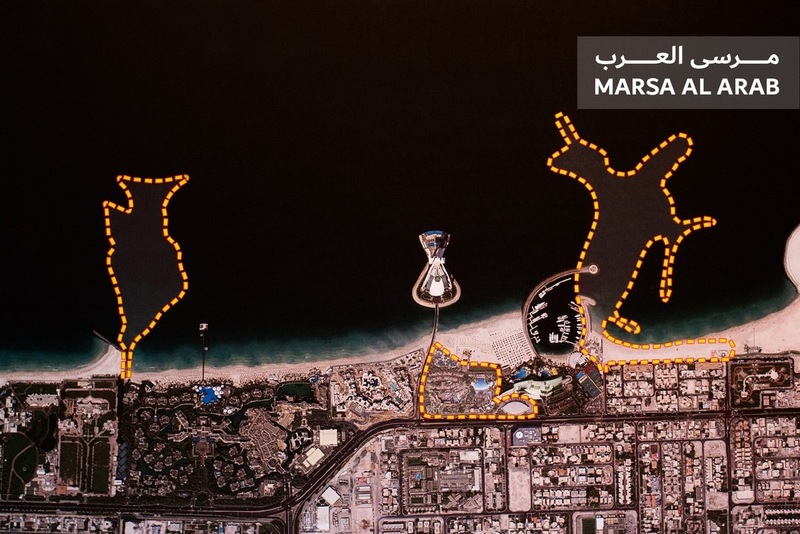 The 11th edition of the event, being held at the Madinat Jumeirah from April 4 to April 8 under the patronage of His Highness Shaikh Mohammad Bin Rashid Al Maktoum, Vice-President and Prime Minister of the UAE and Ruler of Dubai, will see over 1,500 delegates in attendance. With opening remarks from Sultan Al Mansouri, the UAE’s Minister of Economy, and Majid Saif Al Ghurair, chairman of the Dubai Chamber of Commerce & Industry, attendees are expected to be addressed over the course of the four day event by industry leaders such as Jo Malone, founder of Jo Malone, Ravi Thakran, group president of LVMH for South & South East Asia and Middle East, and Robert Welanetz, CEO of Majid Al Futtaim Properties. Developers in the UAE are currently hoping to capitalise on the growing number of visitors to the country in the run up to Expo 2020. 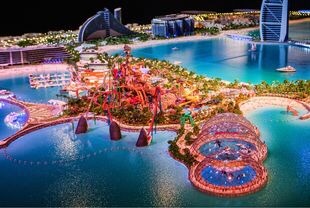 Dubai hopes to attract 20 million tourists that year, an increase of around five million in the next three years. Retailers are currently focusing on delivering unique experiences to differentiate their product, whilst utilising insight into consumer behaviours and attitudes to stay agile and retain customers. 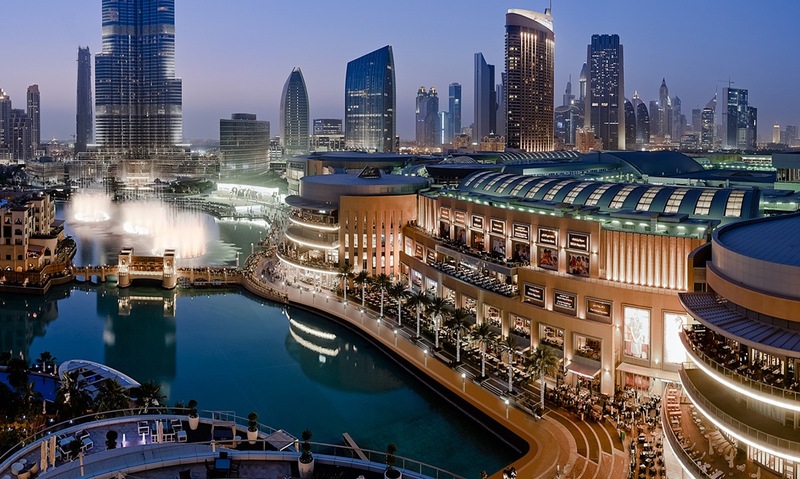 A government emphasis on the tourism sector, competitive deals, and tax-free salaries spurred a decade-long boom in the retail sector in Dubai. Saudi-nased Alhokair franchises brands such as Zara and Marks and Spencer in the kingdom. The board of Egypt’s Medinet Nasr for Housing and Development (MNHD) has approved an offer from a unit of Saudi Arabian retailer Fawaz Abdulaziz Alhokair to build a mall at MNHD’s Teegan development, the firm said on Tuesday. Under the proposed deal, Alhokair, which franchises brands such as Zara and Marks and Spencer in the kingdom, will own and operate the mall for 50 years before transferring it to MNHD, who in the meantime will receive a share of the mall’s revenues. MNHD said the new mall would have a gross leasable area of 68,500 square metres and would take three years to construct. “Such deals should help MNHD to significantly improve on its financial performance and balance sheet, enabling it to unlock significant value from its unutilised land bank,” Cairo’s Naeem Brokerage said in a note. 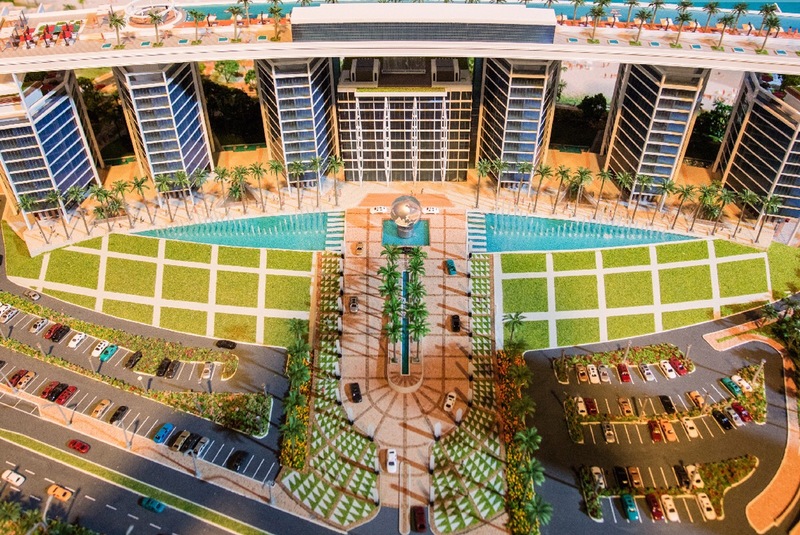 The Teegan development is located in the east of the Egyptian capital, across from Cairo International Airport, and will ultimately cover 3.5 million square metres. Emaar Malls reported a growth in fourth-quarter (October to December 2016) net profit by four per cent to AED 452 million ($123 million), compared to the Q4 2015 net profit of AED 435 million ($118 million). Emaar Malls (DFM: EMAARMALLS), the shopping malls and retail business majority-owned by global property developer Emaar Properties, has recorded a net profit of AED 1.874 billion ($510 million) during 2016, an increase of 13 per cent over the full-year 2015 net profit of AED 1.656 billion ($451 million). FY 2016 revenue recorded a growth of 8 per cent to AED 3.227 billion ($879 million) compared to FY 2015 revenue of AED 2.992 billion ($815 million). Revenue for Q4 2016 increased to AED 835 million ($227 million), which is 8 per cent more than Q3 2016 revenue of AED 774 million ($211 million). The shopping malls assets of Emaar Malls – The Dubai Mall, Dubai Marina Mall, Souk Al Bahar, Gold & Diamond Park and the community shopping centres – welcomed 125 million visitors during 2016, similar to annual footfall during 2015. The Dubai Mall set a similar footfall level of 80 million visitors for three consecutive years despite ongoing expansion in and around the mall, reiterating its reputation as the world’s most-visited retail and lifestyle destination. The gross leasable area (GLA) occupancy levels averaged 96 per cent during 2016. Mohamed Alabbar, Chairman of Emaar Malls and Emaar Properties, said: “As a global business and leisure hub, Dubai is among the top preferred destination for international retailers to expand their operations. Emaar Malls has created a dynamic platform of shopping malls that catalyse the growth of Dubai’s retail sector while offering the nation’s residents and visitors with exciting retail and leisure choices. “In today’s digital age, we are focused on leveraging advanced technologies to ensure that our visitors have memorable experiences at our malls. We will continue to introduce new innovations, strengthened further with digital strategies to ensure that our malls stay ahead of the curve, and redefine the retail sector. 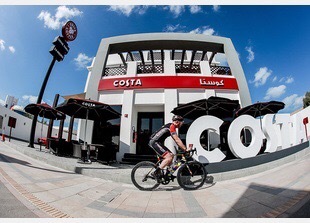 Located near Kite Beach on Jumeirah Beach Road in Dubai, the two-storey Costa Coffee building is open 24 hours a day, seven days a week. Emirates Leisure Retail chief operating officer Kevin Zajax said: “This is a milestone occasion, and the latest offering in our response to what our customers are looking for. They want to be able to get a handcrafted Costa Coffee at any time of the day, sometimes without leaving their car. Costa is developing its food offering with a new ‘made fresh on site’ deli range that is rolling out to more of its UAE outlets and adding new brews to the coffee menu, including the Old Paradise Street limited edition. And to celebrate the launch of the new drive-through, Costa is giving away Jeep Wrangler. Every customer that spends AED30 (US $8) between January 9 and February 9 will be entered into the prize draw. Mall of Qatar, Doha’s new shopping concept with 500,000 sq m of retail space, officially opened its doors to the public on Saturday, with 220 stores launch on day one of the “soft opening”. Officials said the mall is 99 percent leased, with 92 percent currently in the fit-out phase. “We are opening over 220 stores on our first day, which is 60 percent of the gross leasable area,” said Ahmed Al Mulla, CEO. He added: “After working towards a goal for many years, seeing it come to life is one of the most incredible experiences. Mall of Qatar marks a new era of shopping in Qatar – merging shopping and entertainment at our regional super mall. When fully operational, the sprawling complex will boast over 500 shops including 100 F&B outlets. Marina Mall Abu Dhabi, owned by the National Investment Company (NIC), has announced that it will be breaking ground in early 2017 on major mall improvements worth AED300 million, in addition to a new AED3 billion extension. Marina Mall Abu Dhabi will be undergoing a renovation and growing in size with a 120,000 sq m extension designed by DP Architects, the company behind the design of Dubai Mall. The new extension plan will be divided into two parts, the north and south side of the mall, which will include the latest retail and F&B brands and new market entry brands exclusive to the mall. Marina Mall Abu Dhabi will also expand its car parking facilities, a statement said. In 2006, the mall went through major expansion plans, which included the addition of a revolving restaurant tower, as well as an increase in mall facilities and retail outlets. 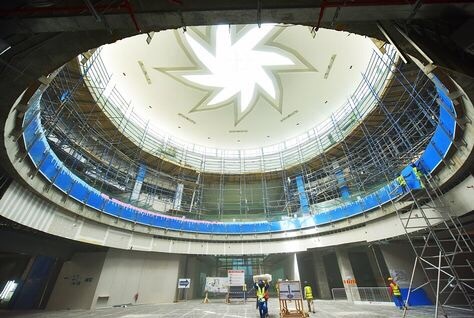 Marina Mall is also home to Marina Eye – Abu Dhabi’s first and only observatory wheel. Amazon.com is in preliminary talks to acquire the Dubai-based online retail market Souq.com for about $1bn, according to a Bloomberg News report. Souq.com, known as the “Amazon of the Middle East,” currently offers roughly 1.5 million products across the Middle East, primarily in the United Arab Emirates, Saudi Arabia and Egypt. Amazon does not have much of a foothold in the region. In September, Souq.com hired banker Goldman Sachs to find potential buyers for at least 30 percent of the company, according to the Bloomberg report. Tiger Global Management and South Africa Naspers – the company’s primary investors – also may consider selling their shares, it added. Big e-commerce ventures appear to be trending in the Middle East. Two weeks ago, Dubai business magnate Mohamed Alabbar announced the launch of a $1bn regional e-commerce site in a joint venture with the Saudi sovereign wealth fund and other Gulf investors. Noon.com is to go online in January with a 50 percent investment from the kingdom’s Public Investment Fund and the rest from about 60 investors led by Alabbar, who also heads the emirate’s real estate giant Emaar. He told a news conference that distribution centres are being set up in the Saudi cities of Riyadh and Jeddah, along with a giant warehouse the size of 60 football stadiums in Dubai. “We expect to become a world player but will concentrate firstly on Saudi Arabia and the United Arab Emirates,” said the president of Emaar, the company that built the world’s tallest building, the Burj Khalifa in Dubai. With an initial inventory of 20 million products, the online retailer aims to expand to Egypt, the Arab world’s most-populous state, at the end of next year or early in 2018. 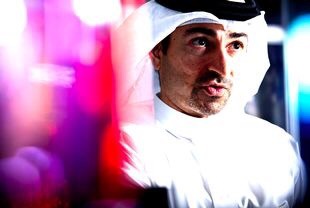 Alabbar, cited by Bloomberg, said Noon would be traded on stock markets in five to seven years, and aims to be profitable within five years.